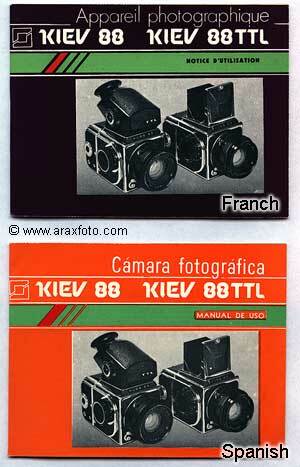 KIEV-88 original user guide on English, German, Spanish. Accessories / KIEV-88 original instruction for use. Free shipping. 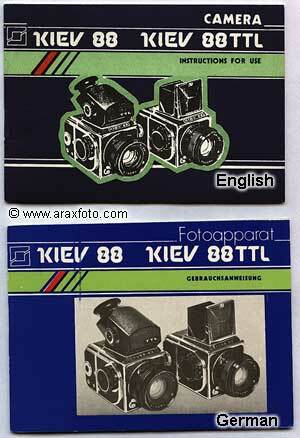 KIEV-88 original user guide on English, German, Spanish. Free shipping. Price: $9 for each manual. With illustrations. Printed for ARSENAL factory in Kiev. It is not a reprint, it is original. If you got Kiev-88, Salyut or Salyut-C (Salyut-S) with or without TTL - you should have this manual, because in other case you can brake your camera immediately after your first experiment with them. You'll have much less problems with your Kiev-88, Salyut or Salyut-C (Salyut-S) when you get this full instruction for use.